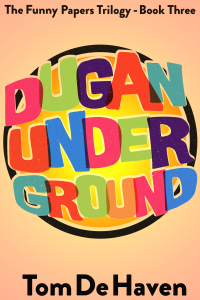 In BOOKS, a brand-new essay about writing and publishing Dugan Under Ground, the final novel in the Derby Dugan Trilogy, and on the Homepage, some fond thoughts on my writing teachers and literary heroes. This entry was posted in NEWS, NEWS and tagged Bob Dylan, Depression Funnies, Derby Dugan, Dugan Underground, Tom De Haven by Tom De Haven. Bookmark the permalink.